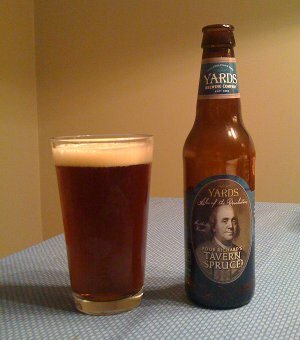 I have this idea in my head that brewing beers along old fashioned colonial recipes might be really cool, and to be honest, I'm surprised that more brewpubs and breweries aren't doing it. You find a ton of old-fashioned English style beers, it seems like there should be more of this type, especially up here in New England. Hmm, maybe the beer secretly sucked in America in those days? The spruce one sounds weird, but why not, I usually enjoy oak aged beers (Innis and Gunn from Scotland is awesome). New idea...open a brewpub making traditional New England beers and ciders! 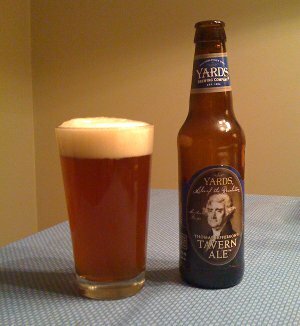 Yeah, I really like what Yards is doing with these and would love to try the other two varieties. None of them seem to be overwhelming successes, but they're really interesting beers to try. I'm with you on Sam Adams, but to me, their major redeeming virtue is that even crappy bars with crappy selections will often have something from Sam Adams on tap, and in such scenarios, I kinda welcome it. They certainly do seem to make a good variety of stuff though. I remember in my younger years, I liked Cherry Wheat a lot. They also do that homebrew contest thing and release a variety of the winners (there was one last year called Lemon Pepper Saison that I really wanted to try, but I couldn't find it anywhere). This page contains a single entry by Mark published on November 18, 2010 6:14 PM. Four Loco is The Stuff was the previous entry in this blog. Best Worst Double Feature is the next entry in this blog.